Beatrice of Silva, O.I.C., also known (in Spanish) as Beatriz da Silva y de Menezes and (in Portuguese) as Beatriz de Menezes da Silva, (Campo Maior, Portugal ca. 1424 – Toledo, Castile, 16 August 1492) was a noblewoman of Portugal, who became the foundress of the monastic Order of the Immaculate Conception of Our Lady in Spain. She is honored as a saint by the Roman Catholic Church. Saint Beatrice of Silva, O.I.C. Beatrice was one of the eleven children of Rui Gomes da Silva, the first governor of Campo Maior, Portugal, after its reconquest from Arab rule, and of Isabel de Menezes, the Countess of Portalegre, an illegitimate daughter of Dom Pedro de Menezes, 1st Count of Vila Real and 2nd Count of Viana do Alentejo, in whose army her father was serving at the time of her birth. One of her brothers was the Blessed Amadeus of Portugal, O.F.M., a noted reformer of the Order of Friars Minor. She was long thought to have been born in the Portuguese colony of Ceuta in North Africa, where her father was serving as a military adjutant at that time. Modern research has determined that she was, in fact, born in the family home at Campo Maior. Tomb of Saint Beatrice da Silva in Toledo, Spain. Beatrice was raised in the castle of Infante John, Lord of Reguengos de Monsaraz. In 1447 Beatrice accompanied his daughter, Princess Isabel of Portugal, to Castile as her lady-in-waiting when Isabel left to marry King John II of Castile and became Queen of Castile and León. Beatrice was her good and close friend, (and later was to receive her support when she founded the Conceptionists). Soon, however, her great beauty began to arouse the irrational jealousy of the Queen, who had her imprisoned in a tiny cell. During this incarceration, Beatrice experienced an apparition of the Blessed Virgin Mary, in which she was instructed to found a new Order in Mary's honor. Beatrice finally escaped her imprisonment with difficulty and took refuge in the Dominican Second Order monastery of nuns in Toledo. Here she led a life of holiness for thirty-seven years, without becoming a member of that Order. In 1484 Beatrice, with some companions, took possession of a palace in Toledo set apart for them by Queen Isabel for the new community under the name Monastery of Santa Fe, which was to be dedicated to honoring the Immaculate Conception of Mary. In 1489, by permission of Pope Innocent VIII, the nuns adopted the Cistercian Rule, bound themselves to the daily recitation of the Office of the Immaculate Conception, and were placed under obedience to the ordinary of the archdiocese. 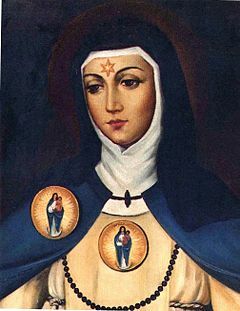 The foundress determined on the religious habit, which is white, with a white scapular and blue mantle, with a medallion of Mary under her title of the Immaculate Conception. Beatrice died in the monastery she had founded on 16 August 1492. 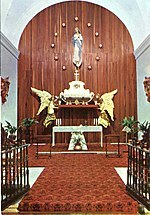 Her remains are still venerated in the chapel of that monastery. In 1501 Pope Alexander VI united the nuns of Santa Fe, which Beatrice had founded, with the neighboring Benedictine Monastery of San Pedro de las Duenas, and put them all under the Rule of St. Clare. Through this, the Order became connected with the Franciscans. Pope Julius II gave the new Order a rule of life of its own in 1511, and in 1516 special Constitutions were drawn up for the new Order by the Franciscan Cardinal Francisco de Quiñones, who resolved some ongoing tensions between the nuns of Santa Fe and the former Benedictine nuns who had been fused into the Order, establishing the community as the Monastery of the Immaculate Conception. A second monastery was founded in 1507 at Torrigo, from which, in turn, were established seven others. The Order soon spread through Portugal, Spain, and their colonies in South America--as early as 1540, as well as in Italy, and France. [a] At its height, there were some 200 monasteries of the Order throughout the world. Beatrice de Menezes da Silva was beatified in 1926 by Pope Pius XI and later canonized by Pope Paul VI in 1976. Her feast day is celebrated by both by the Conceptionist nuns and the Franciscan Order and in Spain on 1 September, but in 2012 was transferred to 17 August for Portugal. 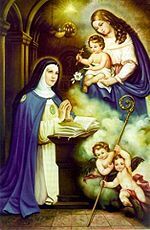 ^ The Brazilian community would later separate from the monastic Order and become the Missionary Sisters of the Immaculate Conception of the Mother of God, belonging to the Third Order Regular of St. Francis. 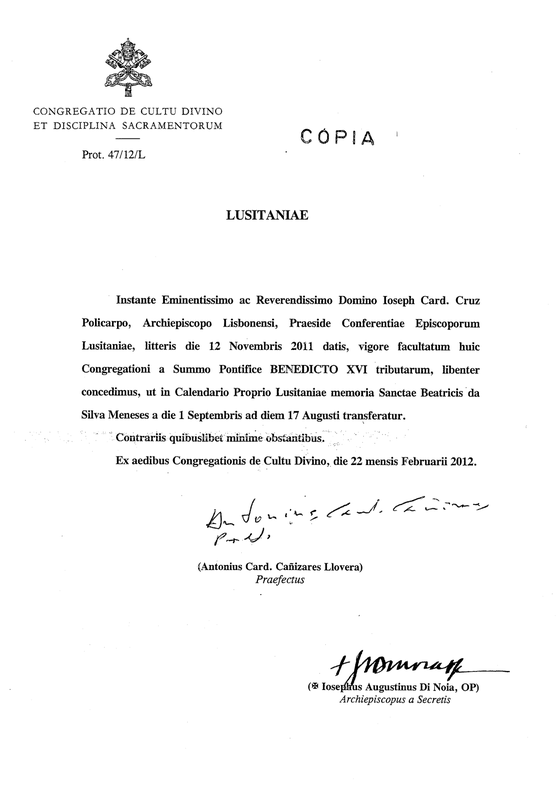 ^ Congregatio de Cultu Divino et Disciplina Sacramentorum (in Portuguese) - Decree from the Congregation for Divine Worship and the Discipline of the Sacraments (Vatican, 12 October 2010) which states that modern research has proven her birthplace to have been Campo Maior, in Portugal. ^ "Santa Beatriz de Silva: Aprobación de la Orden". Orden de la Inmaculada Concepción, Casa Madre OIC de Toledo (in Spanish). ^ "Los primeros años: La bula de Julio II". Orden de la Inmaculada Concepción, Casa Madre OIC de Toledo (in Spanish). 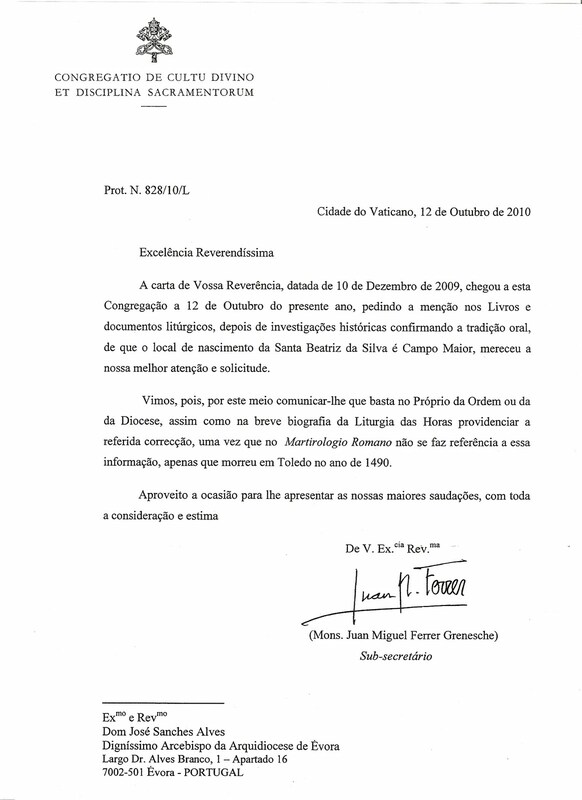 ^ "Decree to the Archbishop of Lisbon" (in Latin). Congregation for Divine Worship and the Discipline of the Sacraments. 22 February 2012. Wikimedia Commons has media related to Beatriz da Silva.